ORLANDO, Fla., Sept. 13, 2018 /PRNewswire/ -- RiskMD is granted a patent for a "System and Method for Valuation, Acquisition and Management of Insurance Policies" following an initial patent filing for provisional in October 2013. This is the first Professional Employer Organization ("PEO") specific patent ever issued. The patent focuses on acquiring, valuing and managing workers' compensation client company exposures regardless of insurance policy structure. "The present invention provides a system and method for acquiring, valuing and pricing of an asset, and then quantifying the profitability of that asset based on the established benchmarks for measurement as set by the risk bearer, its affiliates and clients on a real time basis," according to RiskMD CEO, Paul R. Hughes. 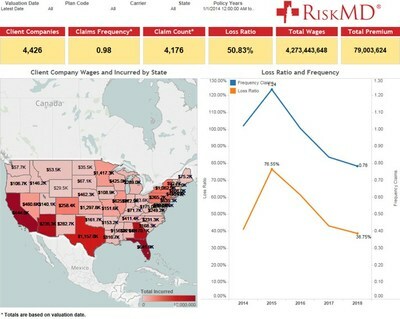 Built on a proprietary SQL data vault, RiskMD provides visual clarity on key performance indicators (KPIs) including loss ratios, frequency and average cost per claim. The system is built on three crucial data sources that are linked together by Federal Identification Numbers ("FEIN's"); the insurance agency legacy system where all formal insurance application data is stored, carrier loss runs and payroll extracts from clients. The system and process is agnostic to both the carriers of record being used as well as the payroll and legacy systems of the PEO. Once collected, normalized and properly staged, the data sources are visualized for expert, more informed decision-making. Unlocking client data to make more informed decisions is foremost in understanding how to acquire, value and properly manage insurance policies and the client companies that they insure. "The vision of RiskMD is to make data-driven decisions in pricing and managing PEO client companies regardless of policy structure," said Mr. Hughes. "While our now patented process has been in place for years, it is very satisfying to be recognized by the United States Patent Office for the invention."